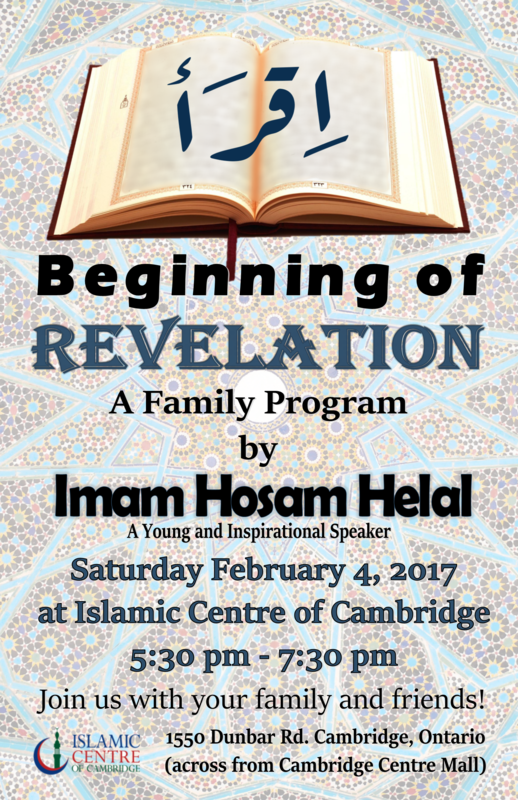 On Saturday 04-February, 2017 between 5:30 PM to 7:30 PM | ICC will be hosting a family program by "Imam Hosam Helal" from Hamilton. The topic of the program is "Iqra: Beginning of Revelation" and Imam Hosam Helal is a young & truly dynamic speaker with expertise in Quran Recitation and Tafseer so everyone is welcome to attend. The International School of Cambridge, ISOC has opened Kindergarten registration for September 2017 so interested parents with children born in the 2013 calendar year can contact the office. Mehfil-e-Naat is being organized by Bazm-e-Mustafa on Saturday 04-February, 2017 between 5:30 PM to 8:30 PM at Chandler Mowat Community Centre, Kitchener. Syed Sabihuddin Rehamani from Pakistan is the guest Naat Khuwan and Dinner will be served after the program so everyone is welcome to attend. ICC is arranging a "Nasheed Night & Dinner" to pay tribute to Late Junaid Jamshed in honour of his past contributions to the Islamic Centre of Cambridge & this auspicious event will be hosted by Humayun Jamshed (Brother), Khalid Mehmood (USA), Imtiyaz Sidat (UK), Mufti Aasim Rashid (Canada), Ilyas Mao (Canada), Taimur Junaid & Babar Junaid (Sons of Late Junaid Jamshed) and the event will take place on Monday 20-February, 2017 from 5:30 PM to 9:00 PM so please mark your calendar for this memorable event. Please make dua for (Sister Bilkis’s grandmother Niyah Kani), she passed away this morning in Pakistan. May Allah (SWA) grant her a place in Jannat-ul-Firdous and give sabr to her family (Aameen). A Milad-un-Nabi program is being organized by Anjuman-e-Ghulaman this coming Sunday 22-January, 2017 between 2:00 PM to 5:00 PM at (Victoria Hills Community Centre, 10 Choppin Drive, Kitchener) and the guest speaker is Moulana Shah Mohammad Anas Noorani. Allstate Insurance have job openings for “Business Development Agents”, please review the position on the Bulletin Board in the mosque lobby or speak to the office for further details. The ICC is looking for volunteers to help with the "Syrian Families" residing at the Holiday Inn. If you can volunteer your time so please contact the office. Thank you for all the pledges and donations made at the “Fundraising Dinner”. Please submit your cheque to the office by today 06-January, 2017 to ensure a 2016 tax receipt. All other donations received after today will be issued a tax receipt for 2017. Please make duaa for (Brother Jahanzeb) cousin of Mohammed Tahir, who passed away today in Pakistan. May Allah (swa) grant him a place in Jannat-ul-Firdous (Aameen).